New York Times bestselling author and Rhode Island native Marie Force shares her love of her home state of Rhode Island—specifically Block Island—in the McCarthys of Gansett Island Series. Marie grew up in Middletown, RI, where family boat trips to Block Island were high points of summer vacations. The McCarthys of Gansett Island is based on the scenery and some favorite spots on the island, including a marina and inn. Many Series readers say the settings Marie writes about are so real they want to move to the Rhode Island locations that inspired them. New Shoreham, the only town on Block Island, is the smallest town in the smallest state, covering some 10 square miles to the south of ‘mainland’ RI. For such a tiny spot, it packs a lot of treasures, including beaches, stone walls, bluffs, bike trails, hills, ponds and plenty of open space that provide opportunities for many outdoor recreational opportunities. There’s also a wide array of restaurants, shops, inns and other quaint businesses to keep visitors well-fed and busy. Visitors can get to Block Island via private boat, ferry or airplane. Private boats may dock at one of the island’s marinas or anchor in Old Harbor or New Harbor. Ferries depart from Point Judith and Newport, RI; Fall River, MA; New London, CT; and Montauk, NY. In good weather, the ferry can be a smooth ride but be mindful of high seas and/or strong winds that can make the trip over to the Island a little challenging. Come prepared with seasickness remedies. New England Airlines, located in Westerly, RI, offers daily flights to Block Island year round. Flying time is 12 minutes! In addition, Cape Air flies between Providence and Block Island during the peak tourism season in summer. Inns, Bed and Breakfasts, small and larger hotels (Block Island doesn’t have any large chain hotels), and house rentals—whatever your vacation style or budget, Block Island has the perfect accommodation. If you want to be near the ferry landing, try The National or Ballards Inn. Cozier inns can offer a more intimate setting, while house rentals may be the perfect fit for families traveling together. 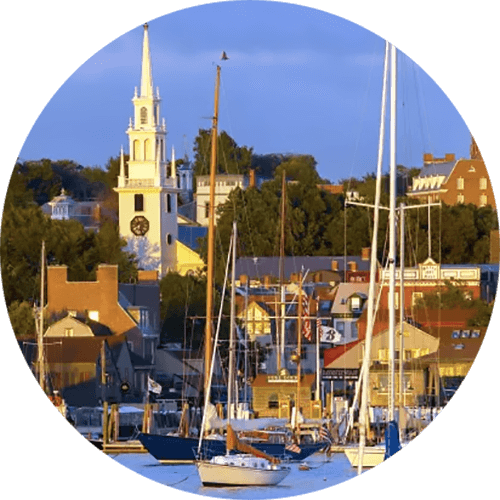 For more information and to look at the variety of places to call home while you’re in Block Island, please click here. While activities such as running events, fishing tournaments, art fairs and Christmas shopping strolls are planned from May through November, Block Island’s busiest season is between Memorial Day and Labor Day. For those seeking a bit more quietude, the off months may be just the remedy for a little relaxation while still enjoying great weather. Now, about that weather. As with many locations in New England, temperatures can vary from one minute to the next. Come prepared for temperatures in peak season from the mid 60s to upper 80s or even hotter and know that the temperature can drop at any moment. If you forget your Gansett Island sweatshirt, you can always pick something up in one of the shops on Block Island. Marie has been coming to Block Island for family vacations all her life and holds this island very close to her heart. 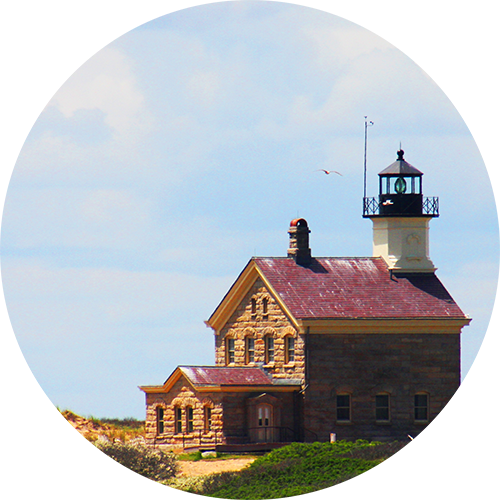 After all, Block Island is the inspiration for Gansett Island! Now that you’re finally here, take some time to enjoy the island’s beaches, shopping, hiking, lighthouses and so much more. As you wander, you’re sure to see a few things that look familiar if you’ve read the McCarthys of Gansett Island Series. Check out this list of things to do or download a copy to take with you. Rent a moped or a bicycle, just off the ferry in Old Harbor, but PLEASE be careful if you do. The roads are winding and the traffic can be heavy. You really don’t want to get hurt here as Dr. David isn’t working this weekend. If you want a private tour of the island provided by a local, you can grab a cab right off the ferry landing, just like Ned’s! Hike Rodman’s Hollow, a beautiful scenic hike in a glacier made hollow. There are two trail options for this moderately difficult hike that includes a few hills. The best way to get there is by cab. Please make sure to apply bug spray and check for small ticks afterward. Lyme Disease-carrying deer ticks are VERY prevalent on Block Island, so please be mindful if you venture into high grass or hiking trails. Visit the Southeast Lighthouse, quite a hike up the hill (not for the faint of heart.) Or an easy cab or moped ride. Visit the Mohegan Bluffs, one of the most scenic parts of the Island with some great history. The Bluffs are just past the Southeast lighthouse. Have a drink at Ballard’s, the inspiration for The Wayfarer. Enjoy the beach, too! Sit on the Adirondack chairs at the Spring House Inn and admire the view with a yummy cocktail! On the road between Old Harbor and New Harbor, note the location of the grocery store, where Marie pictures Grace’s pharmacy to be located on Gansett. Visit Payne’s Dock in New Harbor, the inspiration for the McCarthy’s Marina, accessible by bike or cab near the Salt Pond. Walk out to the end of the main dock to get a feel for the atmosphere, and notice the wooden ramp off the main dock, where Marie has been racing crabs her whole life. While you’re there you must have a Mrs. Payne’s donut! Have a drink at Mahogany Shoals, on Payne’s dock, one of the island’s best-kept secrets, and the inspiration for Big Mac’s Tiki Bar! Right outside the gate for Payne’s, check out the Narragansett Inn, inspiration for McCarthy’s Gansett Island Inn. Also, head over to the Block Island Boat Basin to visit the legendary Oar Bar, which Marie has mentioned in recent Gansett books. Thousands of painted oars in one place. You won’t want to miss it! The easiest bike or moped ride is up Corn Neck Road to visit the North Light where Settlers first landed on BI. Go shopping along Water Street! Enjoy pizza, pastry and ice cream at Aldo’s. Stop for a coffee or iced tea at Juice ‘N Java. One of our favorite stores is Lazy Fish, right downtown, with some wonderful eclectic finds. Check out painted rock! It’s probably twice its original size, tourists and locals alike paint it at least once a week. Get Zen and walk the Labyrinth on Corn Neck Road. Visit the Abram’s Animal Farm. You’ll be amazed at all the exotic animals! Just a short walk to the left of the ferry landing past the Hotel Manisses. Stroll Crescent Beach, just a quick walk from the ferry landing. The rocking chairs on the porch at The National are a great spot to people watch and it’s right across the way from The Surf Hotel, inspiration for The Lawry’s Sand and Surf! The recently renovated Surf Hotel is also a great place to grab a drink and watch the world go by. Newport, RI is a stunning seaside city with impressively gilded mansions, great restaurants, a cobblestone downtown and a huge sailing community. No wonder so many of Marie’s scenes are inspired by Newport. Treading Water, Georgia on My Mind, The Falland Love at First Flightare either set in Newport or include visits to the city. Tourists can sightsee and participate in many events while also allowing the scenes from Marie’s stories to come to life, again. Newport is located 23 miles south of Providence, RI and about 60 miles south of Boston, MA. By Air: T.F. Green Airport just outside of Providence, RI, is 26 miles from Newport and is serviced by major domestic airlines. From the airport, visitors may take Orange Cab of Newport, a public transportation bus, or a rental vehicle. Logan International Airport in Boston, MA is 75 miles from Newport and depending on traffic, which could be significant during peak season in the summer, it may take an hour-and-a-half to get to Newport. Public transportation and car rentals are available. You can book round trip transportation to Newport via the Peter Pan bus line. Prices vary depending on your arrival date and time. For more information and to book, click here. By Bus: Kennedy Plaza in downtown Providence is a hub for the Rhode Island Public Transportation Authority public transportation. For a list of schedules between Providence and Newport, please visit this site. A mega bus is available between Manhattan, NY and Newport (180 miles, 4 hours). For more information please visit this site. By car: Newport is on Aquidneck Island, which also houses the towns of Portsmouth and Middletown, Marie’s home town. If driving to Newport you will need to take a bridge to get to the island (the bridges aren’t very long) and there may be tolls depending on which bridge you take. Once in Newport, please know that parking can be challenging. Click here for travel tips. By Rail: There are two Amtrak train stations nearby. The West Kingston station, which does not have car rentals, is 18 miles from Newport. To get to Newport from the station, there are public buses and a reserved car service. The Providence station is 34 miles away. There are several car rental agencies near the Providence station. For more information, maps and directions, please visit the Discover Newport website. By ferry: A seasonal Hi-Speed ferry service operates between Fall River, MA, downtown Newport and Block Island from mid June to September. In addition, there are other harbor vessels that can help tourists get a different view of Newport. For more information, please visit the Discover Newport site. There are so many options for accommodations in the Newport area—large chain hotels and motels, quaint bed & breakfasts and inns. You can even volunteer to be a lighthouse keeper for the night! As a resort location, Newport can be very expensive, even in the off season. Marie recommends these two lodging choices in an effort to provide pricing options suitable for varying budgets. The Newport Marriott is located in the downtown waterfront area with very close proximity to shopping, dining and the harbor. The Best Western Mainstay Inn is located a few miles from downtown and offers a more affordable option. The hotel has a shuttle that will take you to downtown Newport for a small fee or you may drive or take a taxi. Please call 401-849-9880 for more information or go to your favorite hotel reservation website like Kayak, Reservations.com, Orbitz or Expedia. For more information about the abundance of accommodations in the Newport area, please visit the Discover Newport website. me while you’re in Block Island, please click here. The busiest months are May through September, but weather is conducive to sightseeing and events most of the year. Keep in mind that Newport is a tourist destination, so shopping in downtown can be crowded. Visits to the world-famous mansions can also be crowded and scheduling tours in advance is advised. Make sure to make reservations for dinner, too. On average, the warmest month is July (average high 78 degrees F but can be in the 90s and very humid as late as September) and the coolest is February (average high is 39 degrees F). The most precipitation occurs in March. Here are some fun Newport weather facts, compliments of Weather.com. Aside from visiting the spots that inspired Marie’s books, there are a ton of fun and informative activities in Newport. A trip to Newport wouldn’t be complete without a stroll on the Cliff Walk and a tour of at least one of the gilded-age mansions, playground to the most wealthy families in the country, that will help you visualize an era of aristocracy and wealth. To learn more about the mansions, please visit http://www.newportmansions.org/. Marie’s favorite is The Breakers. While visiting historic sites, you may want to stop by St. Mary’s, the church where John F. Kennedy married Jacqueline Bouvier on Sept. 12, 1953. Take a stroll to the city’s waterfront, where you’ll find a variety of restaurants, shops and other interesting sights. Watch the boats go by—or better yet, take a charter tour and see Newport from the water on Narragansett Bay. There are also wineries, art, comedy and concerts—even polo and tennis on grass courts at the International Tennis Hall of Fame! Check out the calendar of events. For more information about things to do in Newport, please visit Discover Newport. They have a downtown office located next to the Marriott where you can pick up information and schedule tours. It all started with the NBC Nightly News with Brian Williams. New York Timesbestselling author Marie Force watched a segment on the Vermont Country Store (VCS) and the Orton family who owns it and was immediately intrigued by the notion of a family running an old-fashioned country store. Marie visited and shopped at both store locations in Weston and Rockingham and the research for the Green Mountain Series set in Vermont had begun. Visit Vermont to see some of the scenes and local color that inspired the Green Mountain Series. Who knows, you may also see Fred the Moose? If not, you can buy him here. Vermont is well-known for its cheese, maple syrup, fall foliage, mountains, festivals, outdoor activities, artisans and small town life. Natural assets include Lake Champlain, which forms half of Vermont’s western border and is shared with the state of New York, and the Green Mountains used by Marie for the Abbott family’s country store name. For more information about visiting Vermont, as well as a map of the state, please go to http://www.visit-vermont.com/. By Air: Vermont has an international airport in Burlington and is serviced by several major airlines. The nearest airport to both Vermont Country Store locations in Weston and Rockingham is Hartness State Airport in Springfield, VT. Springfield is about 30 miles away from Weston and less than 15 miles from Rockingham. The stores can also be accessed by airports in Albany, NY, Boston, MA, and Manchester, NH. Check airlines and the distance from each airport to the locations you want to visit for the best option. For more information about airports in Vermont please visit this website. By Car: Be prepared to drive and enjoy the scenery in Vermont. Rent a car and explore the small towns as you go from one destination to the next. Keep in mind that you may have limited cell phone coverage on many of the state’s country roads, so write down any directions or phone numbers you may need before getting in the car. Here’s a list of hotels and B&Bs recommended by the VCS near their two stores. For other accommodations available throughout Vermont, please go to the Visit Vermont website. The Equinox: A luxury spa and golf resort located close to shopping and dining in Manchester. Hampton Inn & Suites: This hotel offers affordable accommodations with free hot breakfast included. The Reluctant Panther Inn and Restaurant: Twenty luxurious rooms and suites in three distinct locations, the Main House, Mary Porter House and Carriage House, all featuring elegant design with antique furnishings, fireplaces, marble baths and original, museum quality artwork. Apple Knoll Inn (Weston, VT): Located within walking distance of the VCS, this 1830s farm house has four rooms with private baths, an outdoor pool, parlor with piano and a Rumford fireplace. The Inn at Weston (Weston, VT): The inn has 13 guest rooms (9 with fireplaces) and offers luxurious accommodations, fine dining and lots of outdoor fun. The Colonial House (Weston, VT): The Colonial House is a unique country inn and motel offering a full breakfast along with its rooms. Dinner is available on Friday and Saturday nights year-round and midweek during the summer, fall, and winter holiday periods. Brandmeyer’s Mountainside Lodge (Weston, VT): Ten guest rooms with private baths, cable TV, refrigerators, wall safes and hair dryers. A complimentary hot breakfast is served daily. Readmore Bed & Breakfast Inn (Bellows Falls): This 1892 Vermont inn has five guest rooms, most with fireplaces and whirlpool tubs, and five parlors and common rooms. Most of the food they cook comes from local providers and organic is always the first choice. Halladays Harvest Barn Inn (Rockingham VT): This 1895 farmhouse provides a pond and a view of the Connecticut River. Afternoon appetizers, warm chocolate chip cookies and hearty creative breakfasts are some of the other treats available. Saying the temperature varies in Vermont is like saying there’s a bit of romance in the Green Mountain Series books. They can range between a high of 105 degrees F to a record low of -50 F; the annual mean temperature is 43 F. Don’t underestimate the variability of the weather between elevations. In addition, rain, fog, sudden drops in temperature, snow and thunderstorms can come at any time. Summer, while cool and pleasant, can also be hot and humid. Vermont winters are cold and winter conditions can last from November to May, with the maximum snow depth usually occurring in March. Many people visiting the area in the winter see this as a good excuse to snuggle with someone special in front of a fire. Snow shoes and the symphony, arts and aroma therapy, there’s plenty to do for everyone in Vermont. Of course, one of Marie’s fave things to do continues to be shopping at the Vermont Country Store. She never misses the chance every time she’s in the Green Mountain state. Vermont seemingly has festivals for every occasion—the Vermont Maple Festival, Festival on the Green, The Vermont Dairy Festival, the Apple Festival, the Marlboro Music Festival, and the Vermont Brewers Festival. And there’s art. For instance, the Weston Playhouse Theatre Company is a non-profit regional theater that’s been a part of the local scene for more than seven decades. It is Vermont’s oldest professional theater. Read about its rich history here. Other art venues include the Vermont Symphony Orchestra and the Sage City Symphony, and the Brattleboro-based Vermont Theatre Company, which presents an annual summer Shakespeare festival. Brattleboro also hosts the summertime Strolling of the Heifers parade which celebrates Vermont’s unique dairy culture. The annual Green Mountain Film Festival is held in Montpelier. Daily, seasonal ferries take residents and tourists to and from the islands of Lake Champlain and the Champlain Islands. To find information about these ferries, as well as other ferry service between VT and NY, please visit this website. There are so many other activities in Vermont such as visiting a sugaring house to see how the state’s most famous export, maple syrup, is made. You can also tour the famous Ben and Jerry’s Factory and enjoy yummy samples. And don’t forget about the cheese makers. Find out about all this and more at Visit Vermont’s website.